Can I share a secret with you? I love playing the bad guy. When we’re sitting down to enjoy a board game, if it is one that offers a semi-cooperative experience with everyone teaming up against one player, I’m the first to volunteer to take on that role. Odyssey: Wrath of Poseidon is a good example of this type of game. If you recall, one person plays as Poseidon who conjures storms in an attempt at preventing the other players from navigating their ships to Sacred Island. But quite often there is argument discussion about who gets to play the bad guy. Our solution? We found a game where EVERYONE gets to take on the role of the antagonists! Most games set in the Lovecraftian world challenge you to prevent the oncoming waves of horrors trying to enter the real world through portals and the like. Players typically are civilians or investigators who must solve puzzles to determine the location(s) of the next onslaught. 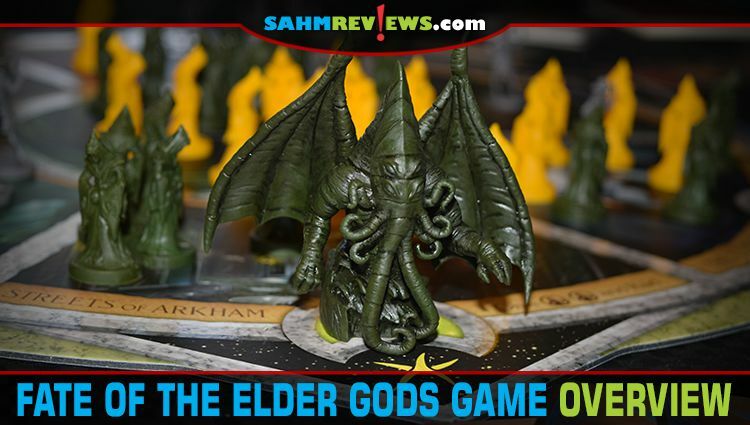 In this new game we’ve been playing, Fate of the Elder Gods by Greater Than Games, the roles are switched. We play as Cultists who are trying to summon their chosen Elder God into our realm of existence! Of course, the investigators are trying to seal away Eldritch Horrors and prevent our Gods from entering the world. 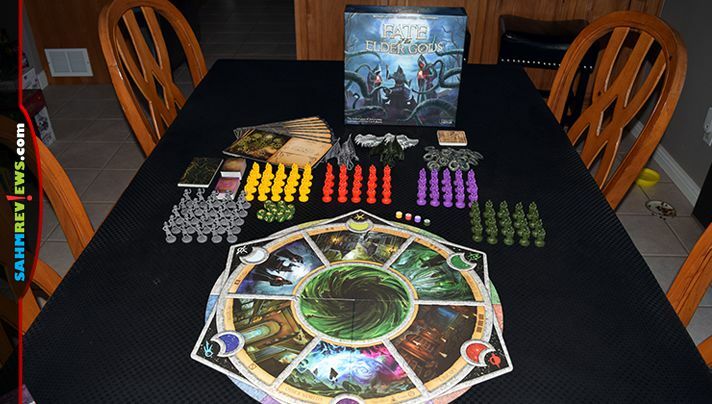 The first thing you’ll notice upon opening the box for Fate of the Elder Gods is the high quality of the components. This isn’t a game of wooden cubes and pawns. 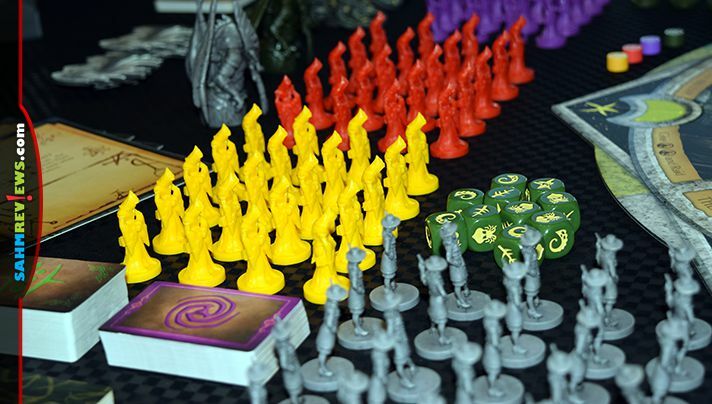 Each of the Cults has their own color-coded set of plastic miniatures and the Fate minis are pre-assembled, multi-part, highly-detailed figures that measure an impressive 3″ tall! Even the Investigators and included dice are custom-made for this game! A very high level of detail given to a game at this price point. 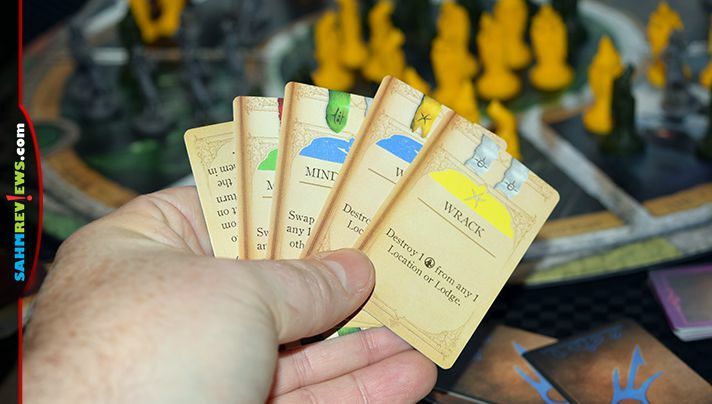 The deck of Elder Gods is shuffled and two are dealt to each player. One is chosen by each person, with the other being returned to the box. All cults receive the Lodge Mat for the Elder God they chose and places it in front of them. After determining player colors, all players put seven of their Cultists in their Lodge, seven in the Abyss and one on each location of the Altar. The circular board is divided up into six different altar areas representing different actions you may take on your turn. 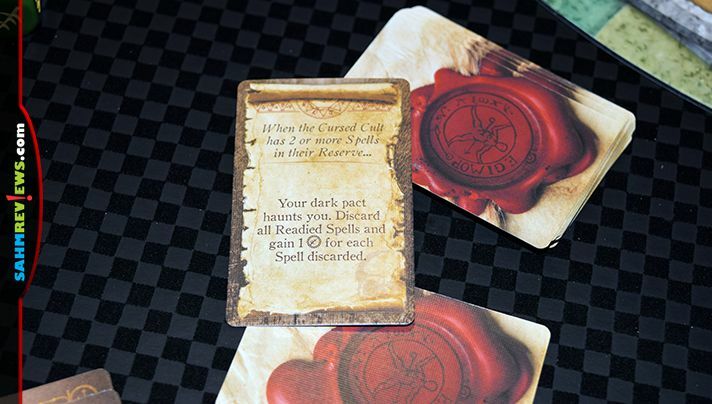 Everyone also begins the game with three Spell cards and the other card decks are shuffled (Curses, Artifacts, etc.) and placed near the board in their designated spots. 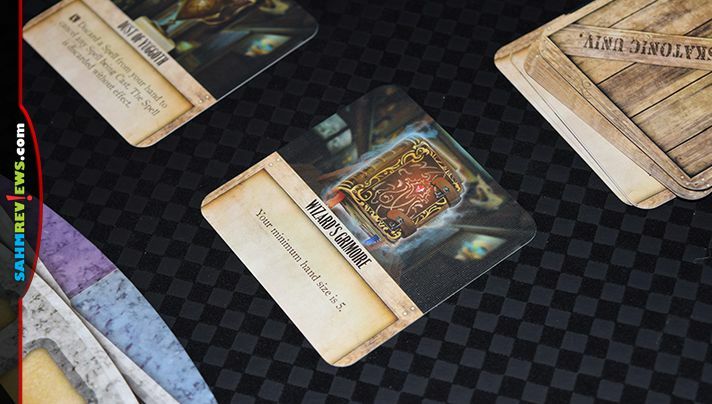 One Investigator is also placed in each Altar location as is one Spell card, face-down. On the personal player board (your Lodge card), there is a circular Summon Track. 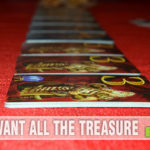 You begin with your token at the top in the “zero” space and want to move it forward until it gets to the nine space, the highest value on the board. While this is happening, Investigators will be sealing away the horrors, giving you a magic seal. These are also placed on your track, working downwards from nine back to zero. 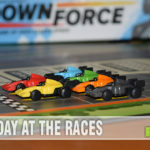 Once the two tracks meet (the seals meet up with your token), you become cursed, which introduces new penalties to the game that are triggered when you perform certain actions. 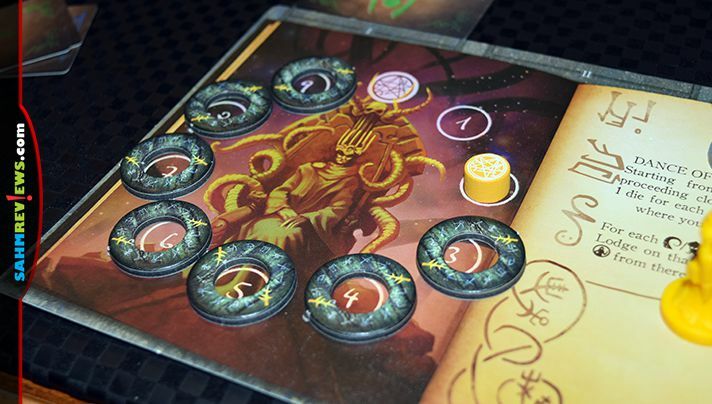 A player’s turn in Fate of the Elder Gods is very straightforward. You will play cards from your hand to move the Fate Piece to a new Altar Location. You either play one card matching the location you are headed to or a pair of any two matching Astral Symbols to move to any location, playing them to the space you begin your turn at. If the location you’re moving to has three or more Investigators on it, they all move into your Lodge (not good). You’ll place one of your Cultist from your Lodge into the same section on the board in which you moved the Fate Piece and an additional Investigator from the general supply, as your activity arouses the suspicions of humanity. Now you may activate the action provided by this location, which comes in two parts. A Basic Action occurs first and will vary according to the Altar you are on. One may allow you to gain new Artifacts while another gives you the option of moving Investigators from one Lodge to another. Once the Basic Action is resolved, you might be able to take an additional Control Action. If you have at least three of your Cultists in the current Altar AND have more Cultists than anyone else, you are awarded this additional action. These vary also and include the options of sacrificing your Cultists to advance your Summon Track, returning Cultists to your Lodge from the Abyss or even transporting your Cultists to other Altar Locations! As the last part of your turn you may get Spells ready. If the location you are on has the appropriate Astral Symbols on the discarded cards (from movement), you may spend them to ready one spell from your hand. 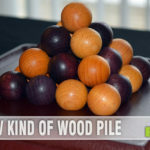 In order to be able to cast spells in the future, which can be done at any time, they must be prepared in this manner and set above your Lodge board, face-down. Not only will these spells be at your disposal for one-time use, the card backs contain an additional Astral Symbol which can be used to prepare additional Spells on future turns! Astral Symbols in the Altar are discarded when a Spell is prepared, so try to be the first to an area where there are a lot of cards! 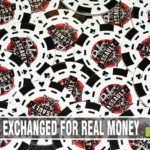 Draw up to three cards if you have less than that in your hand, otherwise draw one additional card (there is no hand limit). At this point if there are five or more Investigators in your Lodge, they perform a raid on you. Roll dice equal to the number of Investigators and either remove them or gain magic seals (or both), depending upon the results of the roll. Each cult takes turns performing actions in the same manner until one person summons their Elder God by getting their token to the “9” space on their track or the magic seals work their way around to zero on the same board. The person who summons their God is the winner of Fate of the Elder Gods. 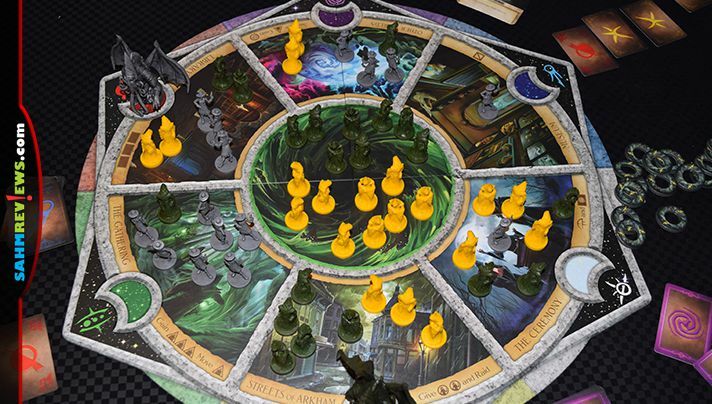 In the case of the Investigators getting the upper hand first, the cult with the fewest number of magic seals on their board is the overall winner! 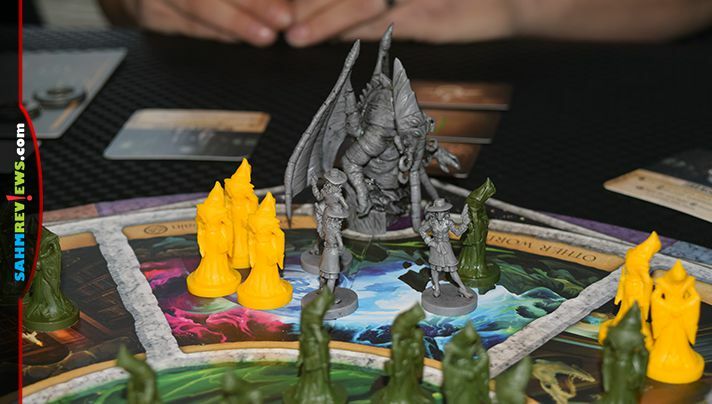 At any price, Fate of the Elder Gods is a terrific value, even without the amazing plastic miniatures and custom dice. You’ll find copies on Amazon or at your favorite local game store. We’ve also heard of an inexpensive expansion that adds new Gods and the ability to summon lore-appropriate creatures to do your bidding! Be sure to see what else Greater Than Games is summoning up over on their website and social media channels (Facebook, Twitter). We’re anxiously awaiting the final version of Legends of Sleepy Hollow, one we previewed for you back in 2017. We hear it’s going to be one of the best titles (in terms of both content and quality of the game) they’ve ever produced! Do you enjoy playing “the bad guy”? This game has such a cool look to it!